Your grill will look new for years to come with the porcelian enameled lid and bowl. 22" steel plated hinged cooking grates offer 363 square inches of cooking space. 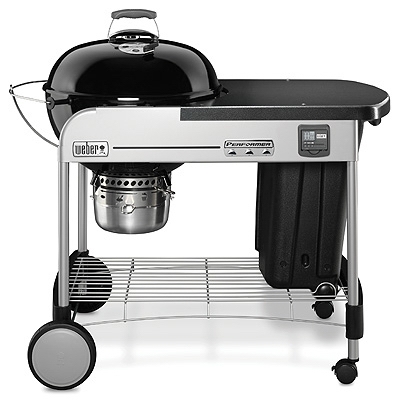 The thermometer in the lid allows you to monitor the temperature of the grill. Lighting your grill is easy to do with the Touch-n-Go ignition - just push the button. The LCD cook timer has a large display and is easily removed. Indirect cooking is easy with the two char- baskets. Keep your unused charcoal dry in the CharBin storage container. The thermostat table proveds extra workspace and has tool holders built in. Clean-up is simple with the One-touch cleaning system. Keep your ashes from blowing away with the high-capacity ash-catcher.